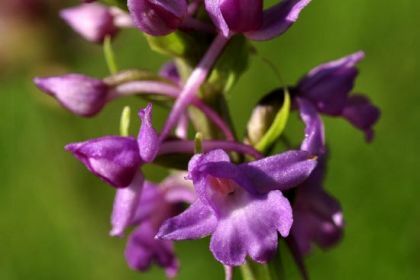 Varying in colour from white through to deep purple, this plant is more often found as a dense, cylindrical spike of pink flowers, sometimes up to 15cm long. Each individual little flower has spreading lateral sepals with the upper sepal and petals closed together to form a hood. The lower lip is 3-lobed and behind this is a long, slender, down-pointed spur. The flowers are extremely fragrant, clove-scented some say, and they bloom in July and August. The linear leaves are unspotted and short, mainly at the base of the plant, with a few small leaves along the stem. This is a native plant belonging to the family Orchidaceae. My first record of this wildflower is at Black Head, Co Clare in 1979 and I photographed it in 2009 at the same place. The Orchid family is a very large one and the plants belonging to it are fascinating and have long been considered very special. 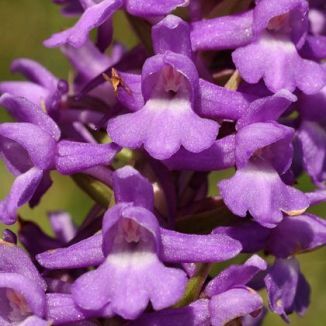 The word Orchis means testicles in Greek and the ancient Greeks attributed this word to the plants of this family as they felt the paired tubers of their root system resembled testicles. Today Orchids are big business with new, large, colourful varieties being produced constantly and available to purchase widely. However, for me there is absolutely nothing to beat the sight of a wild orchid viewed through a hand lens. I am immensely grateful to Brendan Sayers for his assistance in identifying this Orchid.